Get the latest information about the Thinking Out Loud Speaker Series presented by Chicago’s Resurrection University including dates, times and speaker bios. Getting a better night’s sleep starts with better information. If you’re like most people, you’re not only not getting enough sleep, you’re also not getting enough of the right kind of sleep. The Science of Sleep will help explain the things that keep you up at night and let you know what you can do to overcome them. From stress to smartphones to your diet, Dr. Kristine Tohtz will lead a 2-hour wake-up call about how sleep impacts your health. Reserve your place by January 31. 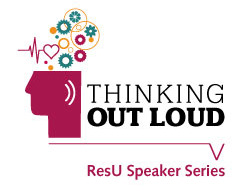 Registration and reception at 5:30 p.m.
On Thursday, February 23, 2017, ResU’s Thinking Out Loud Speaker Series returned for its second Food as Medicine event. Chef and Dietitian Eric Meredith, Dr. Kristine Tohtz and Dr. David Miller educated the ResU community about the best diets for different lifestyles and gave the audience tips on how to stay on track with healthy eating habits. Click on the video below to see our highlights from Food as Medicine II.